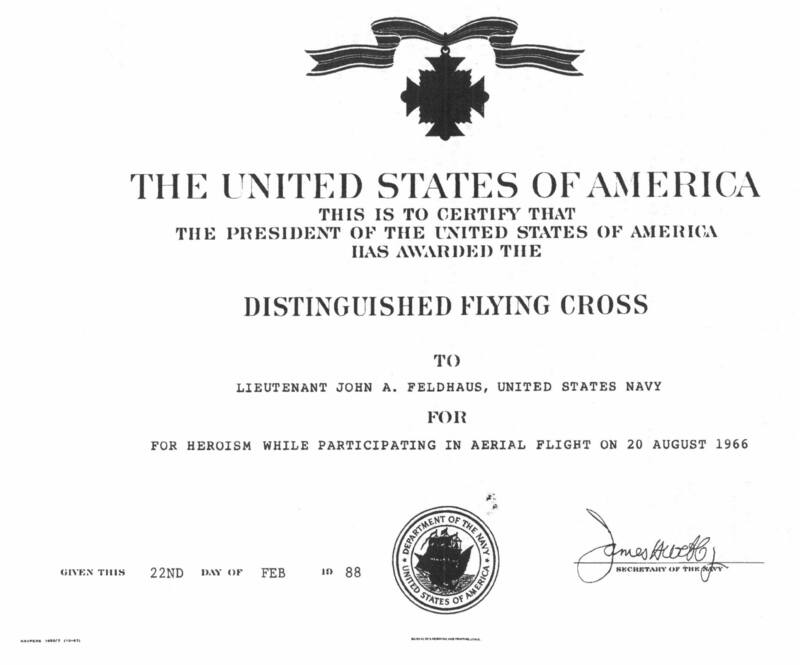 For heroism while participating in aerial flight as a Pilot attached to and serving with Attack Squadron ONE HUNDRED FIFTY-TWO embarked in USS ORISKANY (CVA 34) on 20 August 1966. While conducting the successful search and rescue of a downed pilot 30 miles Northwest of Dong Hoi, North Vietnam, Lieutenant Feldhaus, flight leader of a rescue combat patrol, overhearing on the radio that a pilot was down near his general area, immediately proceeded to the reported area. Courageously and skillfully transiting known areas of heavy enemy anti-aircraft down positions the flight arrived at the rescue scene safely. 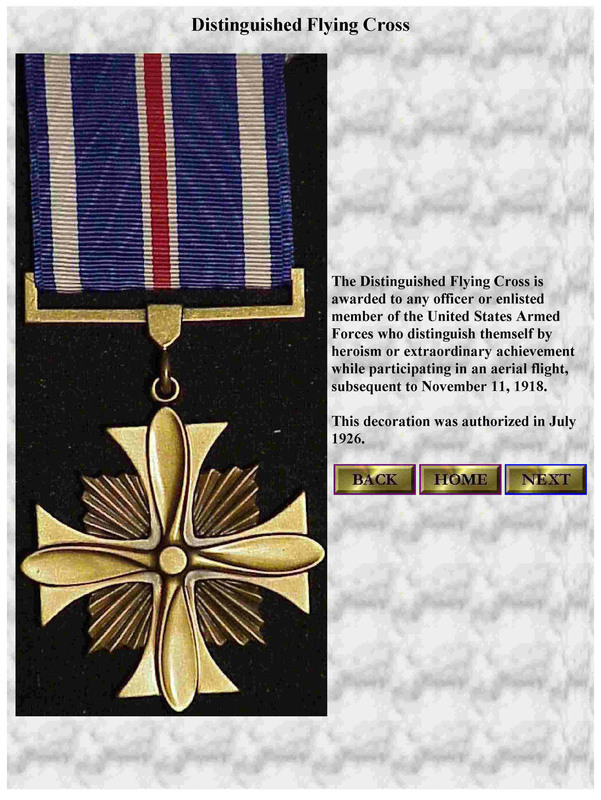 Placing his wingman as high cover, Lieutenant Feldhaus, within three minutes, and with great expertise, narrowed down the search area to a one mile square, established radio contact with the downed pilot, and directed by the pilot, pinpointed his position. Directing his wingman to depart and return with the rescue helicopter, he maintained a protective cover over the downed pilot, staying low and courageously braving enemy ground fire in the area in order to be alert to any enemy movement toward the downed pilot. When the rescue helicopter arrived and attempted to approach, the downed pilot reported that he was drawing heavy ground fire from a nearby ridge. Ordering the helicopter to hold off, Lieutenant Feldhaus heroically attacked the ridge drawing the ground fire upon himself. Directing the helicopter to try another approach, he continued his attacks upon the ridge allowing the helicopter to make a successful pickup of the downed pilot and withdraw from the immediate area, drawing more enemy fire as he escorted the helicopter safely around and between enemy anti- aircraft fire. Upon reaching the safety of the water, he learned that another crewman was down in the same general area. Heroically transiting a now fully alert enemy anti-aircraft defense, Lieutenant Feldhaus and his wingman again entered the search area. After almost an hour of searching the flight was directed to abandon the mission. By his heroic actions, outstanding display of airmanship, and loyal devotion to duty, Lieutenant Feldhaus reflected great credit upon himself and upheld the highest traditions of the United states Naval Service.